Last night was gearing up to be an historic one as early numbers continued to pour in and it showed that Beto O’Rourke was ahead in the polls to possibly unseat Senator Ted Cruz. Unfortunately, as the night drew on, it was not meant to be as Beto won 48 percent of the vote in Texas, 3 percentage points short of Cruz. Texas has not elected a Democrat to the Senate in decades. Thousands of social media users flocked to Twitter, including celebrities, to use the hashtag #Beto2020 in the hours after the race was called. 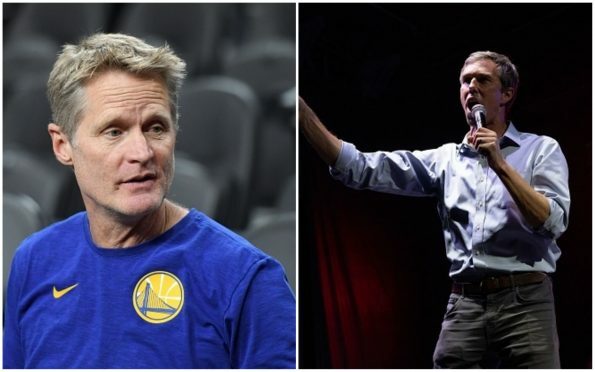 Steve Kerr, who is often a politically outspoken figure in the sports world, also took to twitter and the Golden State Warriors head coach joined calls for Rep. Beto O’Rourke (D-Texas) to launch a presidential bid in 2020. You’re slipping further and further, sir. My sympathies. Keep your Cali way of life out of Texas!! Cruz wins! You live in California. Also you’re the most overrated coach in the NBA. This from a man working in a poop/syringe/crime filled city. Oh yes take his advice and make this our American dream. You’re already planning this mans next loss? Give him more than a day to mourn. Kerr will do anything to attract free agents.